There is a very simple way to think about how to grow business. It requires us to think in terms of markets and products. 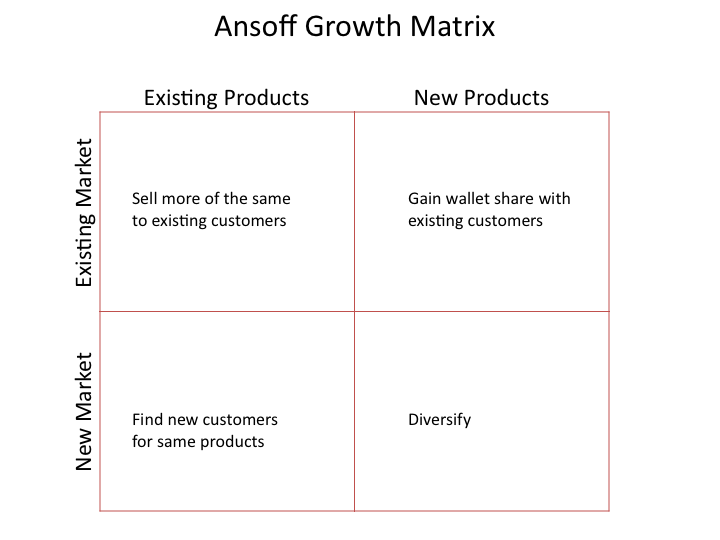 It is more popularly known as Ansoff Growth Matrix. The matrix tells us it is easier to do 1 and gets progressively difficult to do steps 2, 3 and 4. There is a problem with this matrix. It is product driven as opposed to being customer needs (jobs to be done) driven. When you look through the lens of your current products and new products you end up with approaches like unnecessary M&A and Facebook phone that are not aligned with how customer needs and how those needs are changing. 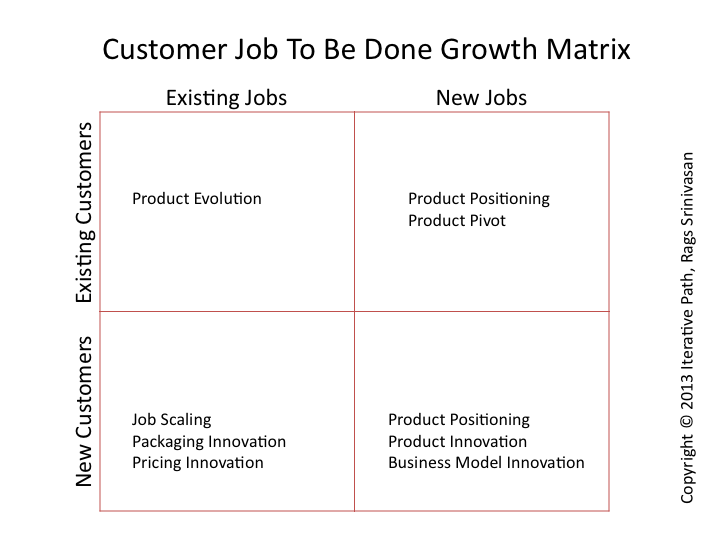 Let us redraw the matrix but now with Customers (customer segments) and Jobs as the two axes. If you are not aware of the “jobs to be done metaphor“, please see here before reading further. Briefly, the metaphor asks us to think about customer needs as jobs to be done. Customers hire products among many alternatives to fulfill those jobs. Now it is not anymore the question of how to sell more of same products or build new products but a question of what are the current jobs we are addressing and what new customers and new jobs provide us opportunities for growth with our core competence. Existing Customers and Jobs: Continue product evolution that cements your product as the best candidate for the job. New Customers and Jobs you currently address with Existing Customers: Here the invariant is the jobs – two different segments have the same job to be done but you chose one segment over other and now considering serving the second segment. Understand the reasons why you did not choose that segment in the first place – is it the challenges in reaching them?, is it their willingness to pay? etc. Understand that different customer segments have different alternatives for the same job and hence different reference price. Choosing to serve lower willingness to pay segment should not come at the expense of price erosion in higher willingness to pay segment. My recommendations are to focus on packaging and pricing innovations that help protect current profits and add net new profits from new segments. It is not revenue growth at the expense of overall profit drop. New Customers and New Jobs: You still have the option of better product positioning to help capture new markets. But most times you are looking at completely new jobs that require product innovations and business model innovations. But the advantage is your focus on customer jobs and not on products – your innovations are aligned with customer jobs. While this step once again proves to be most resource intensive with most uncertainty, taking the jobs approach helps you ease into this without taking big risks, pie in the sky product innovation or expensive acquisitions. There you have it, your recipe for growth derived from customer job to be done. Have you evaluated using circunstances instead of customers in the vertical axis? I beleive that in the job to be done theory, we are already looking into the world through the lens of the customer so it would not be an important variable in the matrix. The same job and the same customer on a different circunstance may need a totaly different solution, an example is when i have the job to “provide energy to my applications WHILE HOME” and the utility companie provides a perfect solution but when the same job occurs to me on a different circunstance “WHILE CAMPING” i may need a different solution like a solar panel. I would propose something like adressed circunstances and non adressed circunstances in the vertical axis. What do you think? Ah, Principles of Marketing is all coming back to me…haha thanks for the refresher! If we look at our offering (product or service) as a bundle of benefits we may choose to lead with different different benefits for different jobs. It would be about highlighting heart benefits of Bayer Aspirin over its pain relieving benefits. It is however not going to be that easy and obvious as Bayer had for most of us – enterprise or startup. In such cases product pivots combined with product positioning are needed. Love it Rags. On the upper right quadrant. “Product positioning” presupposes you have product functionality to serve existing customers’ new jobs. Would that typically be the case? Or would the need be for different functionality instead of different positioning?